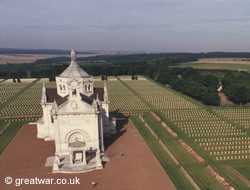 During the year there are regular events held in France to commemorate battle actions and anniversaries on the WW1 battlefields of the Western Front. In addition to the regular events there will be events specifically arranged to mark the centenary of the First World War. A website (French, English & German) giving dates of events, Remembrance trails, projects, exhibitions and battlefield information for visitors for over 2000 projects in France throughout the centenary which carry the l'agenda du Centenaire logo and accreditation. The website also includes four walking/cycling trails, history of the battles information, and advice for arranging your visit to the regions. Website for 14-18 Mission Centenaire for Remembrance in the Aisne during the centenary of the First World War.